I am a paper maker and mixed media artist from Long Beach, New York. My latest series, entitled “Washed Up,” incorporates handmade paper with items I find on daily walks along the beach. During the residency I plan to continue this series by bringing various pulps with me and adding local Azores water and found objects to the paper I will be making. The perpetually changing ocean has been a valuable source of inspiration for my artwork. 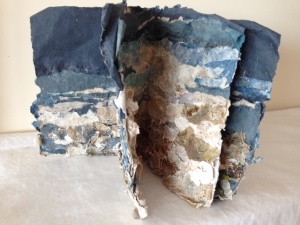 In previous series such as ” Grottoes,” and “Gifts from the Sea,” it has served as a metaphor to depict my struggles to move from periods of inner churning to places of refuge. In the new series I am also addressing these themes, but as the work evolves I find myself wanting to add to it a sense of appreciation and delight at the ocean’s bounty. June Burden is a former high school teacher with B.A. and M.A. degrees in English Literature. Taking a class called “Visual Diaries” at the New School in New York City led her on a new career path. She is currently a member of the Graphic Eye Gallery in New York and has exhibited in many juried shows in the New York area. Burden recently completed a residency at MassMoca museum in North Adams, Massachusetts.